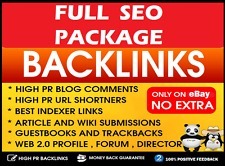 DIAMOND PACKAGE: I will distribute your press release to 500 backlinks and 7400 Directories with a report. Include URL and other media contact for your website in the content. The result will be 80% Unique. The gig is 100% safe. I will need 2 URLs from you. The number of words for the content will be 300-500 words.